When you are thinking about purchasing a log home, one of the items that you have to take into consideration is the wood species. Homeowners are looking for appearance, resistance to decay, insulation value, stability, and cost. Stability of wood is how much shrinking, twisting, warping and checking the wood will experience over the years. Homeowners have a few options when it comes to wood species. You will want to know what kind of wood is the best to use for your log home. Most importantly, you will want to consider which wood characteristics best suit your needs. 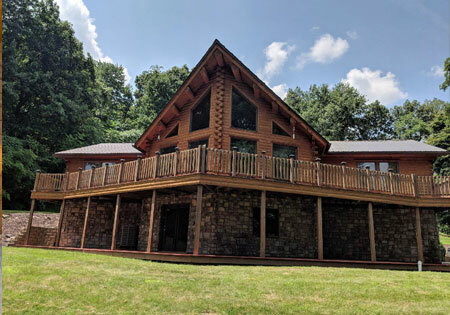 Let's take a look at some different types of woods used in log homes. Pine - One of the most commonly used wood species for log home building. It is strong yet lightweight. Produced along the East coast and in the great lakes region, this wood is readily available in greater lengths. Pine is not naturally resistant to decay or insects. It is typically kiln-dried to reduce moisture content. Fir - Like Pine, Fir is inexpensive. It is attractive and is known for its light reddish-brown color. Fir is not naturally resistant to decay or insects and is typically kiln-dried. Spruce - Spruce is moderately expensive. It is light in color and is available in mountainous regions throughout the U.S. and Canada which makes it difficult and costly to harvest. Spruce can be very heavy and is not naturally resistant to decay or insects. Typically kiln-dried to reduce moisture levels. Oak - It is the most common hardwood used in log home construction. It is known for its grain and strength and color is a light brown and can be very heavy. Available in the Midwest and is priced comparable to Pine. Typically kiln-dried to reduce moisture content. Northern White Cedar - This wood is more naturally resistant to insects and decay which is a very desirable trait. Cedar is a attractive wood and because it is a soft wood, it is very durable and easy to work with. This wood is lightweight and less likely to check and warp. It is truly one of nature's best woods for outdoor usage. Because of its large cellular structure, Cedar can be air dried to a desired moisture level as opposed to forcing or kiln-drying. Also Cedar has the highest R-value per inch of any species used in log home construction. Western Red Cedar - This wood grows long and straight. With natural preservatives like Northern White Cedar, it is more resistant to decay and insects. Color varies from a dark reddish brown to a nearly white. It is grown only in the Pacific Northwest and is one of the most expensive wood species. Building a log home is a major decision. Cost alone cannot be the only deciding factor.